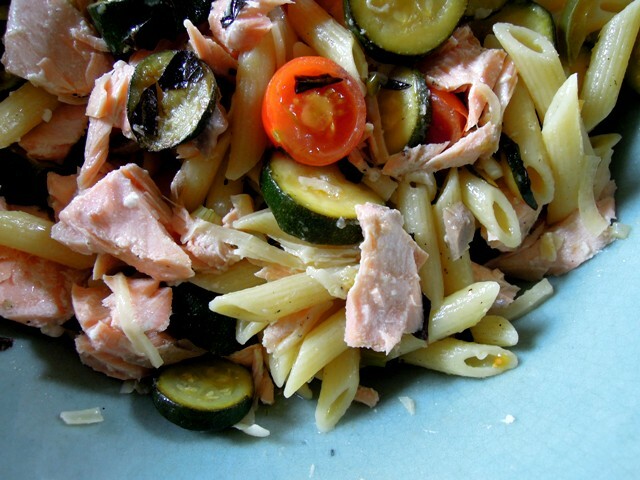 You may have heard the three ingredients for this month’s Recipes for Life challenge are salmon, courgette (zucchini) and pasta. Sarah from The Garden Deli has been an active supporter of the Recipes for Life challenge since it started back in February. Only problem is, sometimes the trio of ingredients include meat or, as is the case this month, fish. And as Sarah is a vegetarian that’s presented a slight problem. But because both SWALLOW and Bangers are inclusive types, and because Sarah asked so nicely, we’re happy to let her enter a vegetarian dish on the proviso that I test it out to see if it works with said meaty/fishy ingredient. 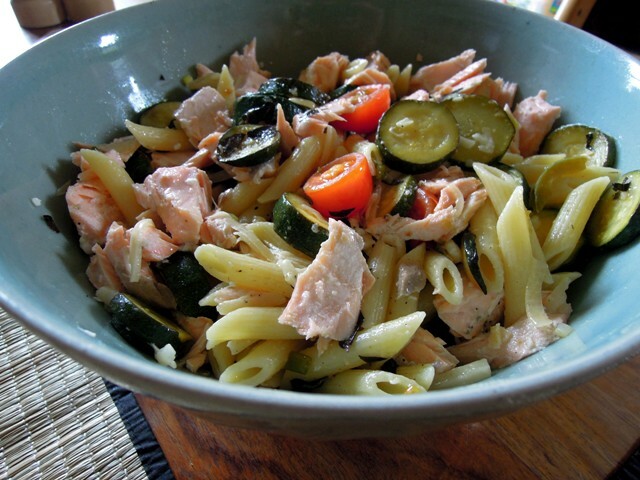 So that’s what I bring you here – Sarah’s Warm Pasta Salad with Courgette & Herbs, but with my addition of some oven-baked Scottish salmon. 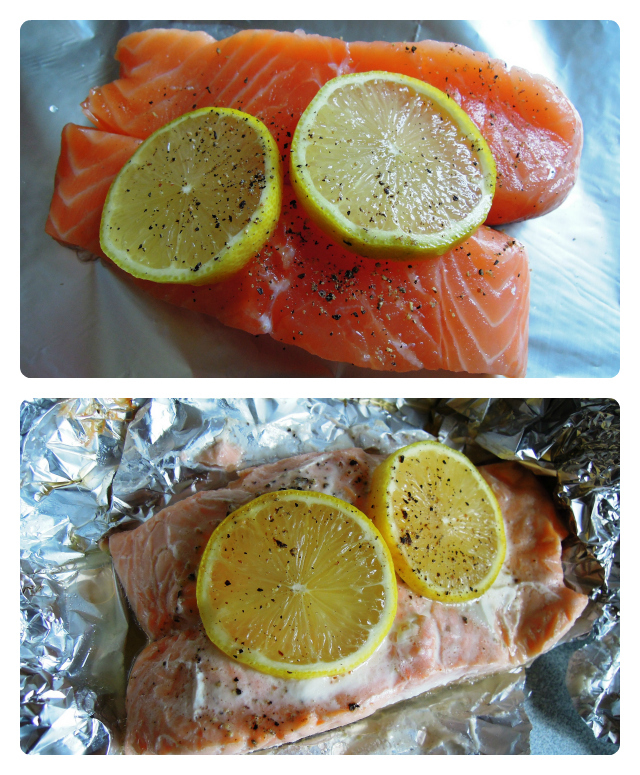 I topped a couple of Scottish salmon steaks with lemon slices and a grind of black pepper and then wrapped them loosely in foil. I then baked them in a fairly hot oven for around 15 minutes until just cooked through, when the bright pink turned pale pink. At the final stage of assembling the salad, I flaked chunks of the salmon into the dish. Unfortunately I’m allergic to avocado so I had to adjust Sarah’s recipe a little more by boosting the amount of courgette and adding half a green pepper to the recipe too. Because I was cooking it for friends and their children as well as our own, I decided to omit the chilli as I wasn’t sure if their kids would be able to handle it. I only had cherry tomatoes rather than plum, and I grated the parmesan rather than slicing it as I knew one of my friend’s children wasn’t too keen on cheese so I attempted to disguise it by mixing it in before serving. Oh, and the fresh herbs I chose to use were oregano as we have so much in the garden right now. But other than those little divergences, I stuck to Sarah’s recipe, and very good it was too. We enjoyed it for lunch today, and I’ll be having the leftovers for supper once I’ve got this blog post out the way. I would definitely recommend giving Sarah’s recipe a go. Next time I make it I will definitely add chilli. It was fine without but I think it would be all the better for that little chilli kick. Chilli and lime are a match made in heaven, as they say. I’m hosting the Recipes for Life challenge on behalf of the charity SWALLOW. Based in Midsomer Norton in the South West of England, this incredible charity works hard to support adults with learning disabilities live life to the full. One of their popular activities is the weekly cookery club and this challenge aims to find simple, tasty and wholesome dishes SWALLOW users can recreate in their cookery classes. The best of these will appear in a new cookbook SWALLOW is planning publish later this year to help raise much-needed funds for the charity. If you’d like to enter this month’s challenge, you’d better get your skates on as the closing date is 25 June – only two days away. Thanks for ‘road testing’ the recipe! I like that you’ve changed the ingredients to suit different tastes. If I’d thought, I would have used oregano too – but now you’ve given me the idea it will definitely go in next time. And thanks again for letting me enter a salmon-less recipe. Both your version and Sarah’s look lovely. Have cooked a large trout for dinner tonight and I reckon leftovers would be good in this fab pasta salad too. Thanks Andrea. Oh yes, I’m sure trout would work really well.